Hey its a Christmas album that doesn't make me want to kill myself. 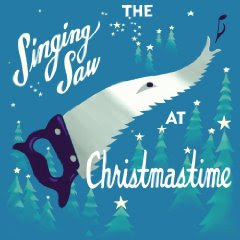 Julian Koster (of the Elephant 6 collective) manages to turn some of the jolliest Christmas tunes into some hauntingly beautiful pieces using his singing saw. This isn't one to put on while you're celebrating baby Jesus with your family, but it's pretty amazing what the man can do with a sharp tool. Hey now! There happen to be plenty of great Christmas albums! This is really fantastic though. And I DID listen to this with my family! I alternated between this and the Beach Boys and A Charlie Brown Christmas while I was decorating my family tree last week. This record is great. I saw him play some carols at a mansion my friend works at a few weeks back. Super low key, only a handful of people there. It was fantastic. I wrote about it and recorded the whole thing. Does anyone have the new Japanther album.... I need it lots!!!! PLEASE EVERYONE WHO ENJOYS THIS, PURCHASE THE RECORD. It's kind of unbelievable to me that fans would download a record like this that is in-print and sells next-to-nothing for free instead of supporting the artist. It's certainly upsetting. Go to the Merge site, pony up the $9 and support Julian. Christmastime all year!